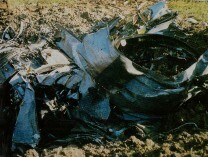 It crashed near Massa Marittima, near Livorno after take off from Grosetto. 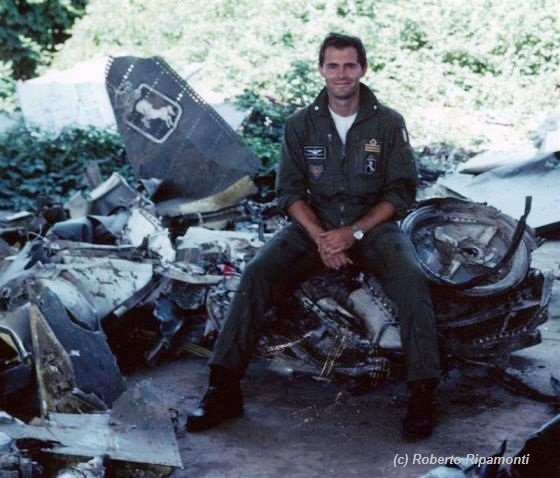 It was hit by lightning-strike and the pilot Capt Roberto Ripamonti had to eject at 1000m. 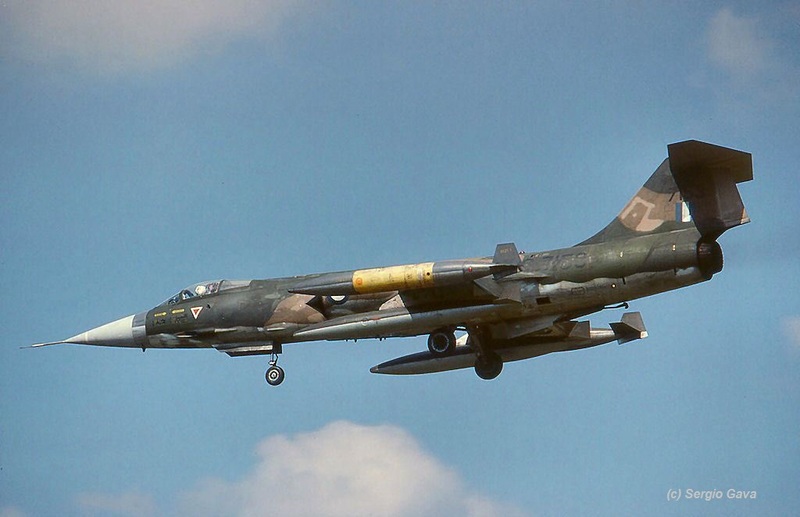 He stated: "Good thunderstorm and a bad radar vectoring with me unable to detect the cb because I was locked on my leader...which was without radar". Beneath the photo provided by Roberto showing him sitting on his wreckage in June 1991. 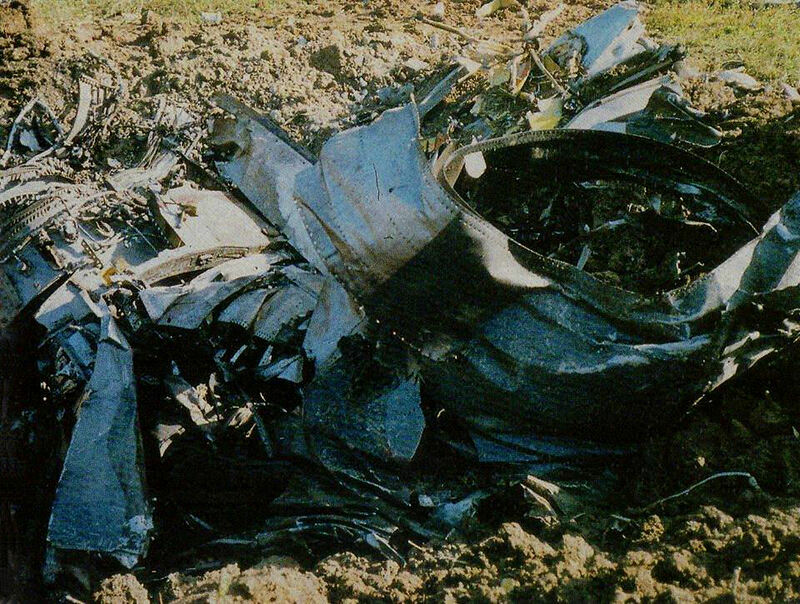 It was written off, gladly pilot Capt Evagelos Rousis ejected safely with his Martin Baker seat. 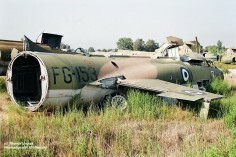 It encountered an accident during landing when its nose landinggear collapsed, the pilot ejected and aircraft run off the runway damaging its complete landing gear. Beneath a photo of the wreckage somewhere in the grass dumped at Araxos air base (thanks to Themis Vranas) and also a photo showing this aircraft 7153 landing at Istrana on August 25th, 1986, during a squadron exchange taken by Sergio Gava. 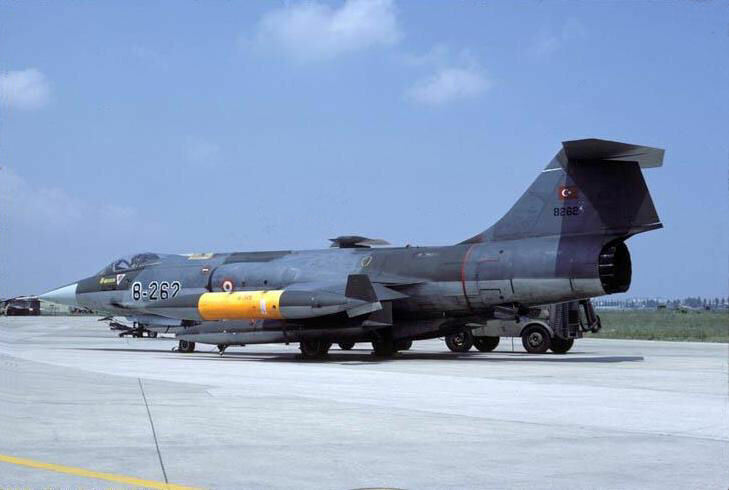 (USAF serial 64-8301) It crashed near or at Balikesir. The pilot was safe. 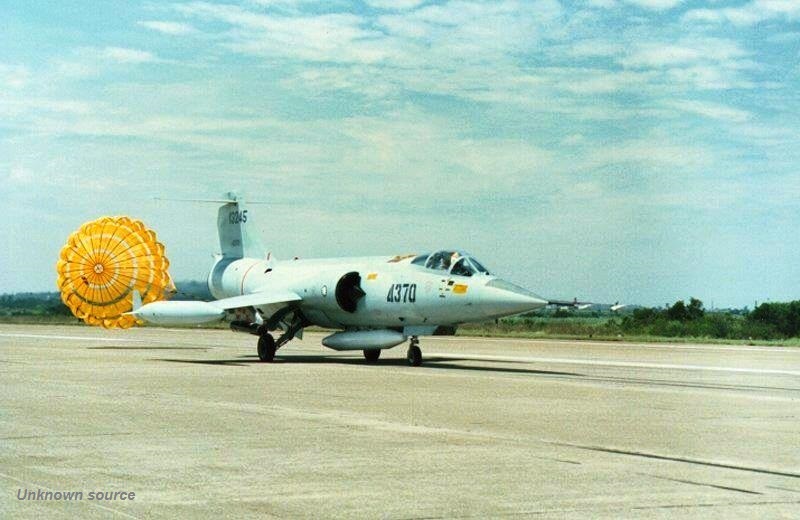 (USAF serial 65-12750) It failed taking off, overran the runway and crashed and exploded killing the pilot Maj Guo Chi Huei, He was tragically burned. A withness reported: The accident plane was one of a flight of two that took off side-by-side. The other plane was another instructor pilot YANG Ru Zong. 67th Class. 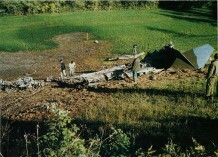 At the end of the runway, the arresting cable and net failed to catch the accident plane. It overran straight down the runway, and stopped in a field, about 100 m from end of runway 05. The accident report claimed two causes. 1. Pilot's knee board (metal panel with check list card, frequencies card, &c) fell off, and jammed lower end of control stick, because lower end of control stick had a spot where it wasn't burnt, and the knee board was bent with a U-shape dent. 2. After aborted take-off, throttle was back from afterburner to max mil power, not to idle, so it didn't decelerate, and penetrated the net. 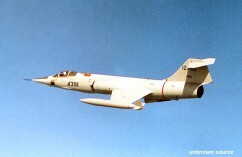 However, other 12th Squadron instructors later tried in another powered F-104 cockpit, and couldn't jam the control stick with a knee board. They suspected he reversed the procedure to trim the plane: after normal take-off, at hangar-roof height, retract landing gear, then flaps. They suspected he first retracted flaps, and lost lift. If it crash-landed from hangar-roof height, then it would crush the landing gear, instead of overrunning straight down the runway. So unsolved mystery. Some believe the pilot ejected safely, who can confirm this? 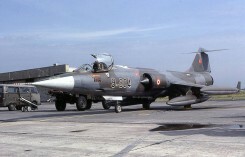 (USAF serial 64-8262) It crashed near Siverek. The pilot was safe. Photo beneath was taken during a squadron exchange which took place till end July 31st. The next day it was lost. 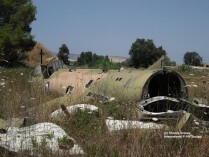 (USAF serial 63-8055) It crashed near homebase Diyarbakir. The pilot was safe. This TF104G crashed near Massa Marittima (near Grosetto) after encountering an engine failure. Both pilots T.Col Giuseppe "Pino" Fognani and Ten. Cpl Ugo Gentilini both ejected safely. 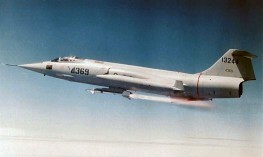 (USAF serial 63-8457) It crashed near Lugan (Lu Gang). Both pilots, First Lieutenant Chao Wei Lien (24) in front seat, Major Ger Jin Chi (31) in back seat, were both sadly killed. It crashed into sea near the coast of the island of Yunlin (Taiwan) at or near Si Luo River mouth, Tai Xi, Yun Lin County. It lost control during a AHC ("maximum performance operation") training mission, came down in a spin and toke one pilot with her down. The other pilot could eject but was sadly drowned. 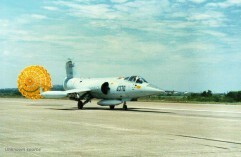 (USAF serial 63-13245) Crashed into sea at 5:58 PM after an engine flame-out due to a mechanical malfunction. Pilot Capt. Wang Tien-Hu ejected safely and was rescued by an S70C helicopter. (USAF serial 75-6904) It crashed near Dursunbey, Balikesir. Pilot 1stLt T. Bahadir Demirel (26) was sadly killed. Photo beneath was taken during rotation at Lechfeld back in 1981. (USAF serial 71-7301) It crashed at or near home base Balikesir. The pilot, 28-yr old Lt. Yalcin Yakakayi, was sadly killed. (USAF serial 63-13244) It crashed into sea, near Xin Zhu, after the pilot, Chang Chi-Chiu, lost control after the engine malfunctioned. Gladly the pilot could eject in time and was safe. Beneath a photo of the aircraft when it was used for shooting exercises. 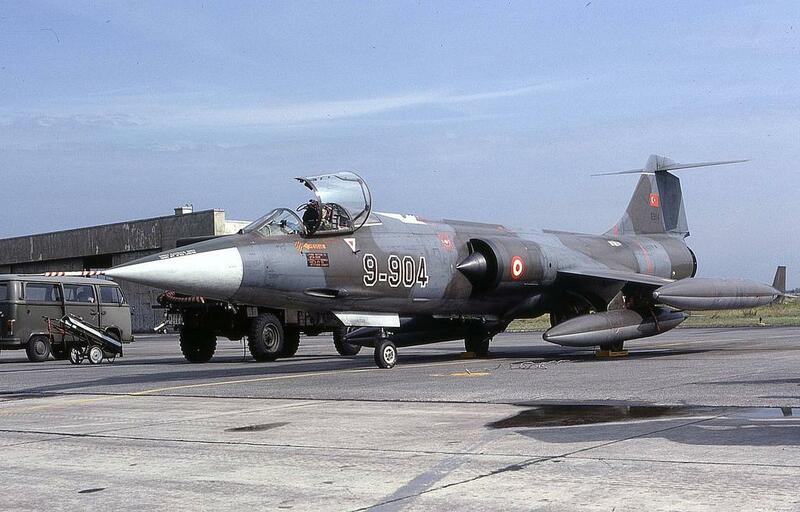 These starfighters crashed after a mid-air collision during a 4-ship formation interception training. The pilots, Capt Andrea Scali and S.Ten Fabrizio Majerna, both ejected safely although Majerna endured a fracture of his tibia and the schiaccimaento of one vertebra. 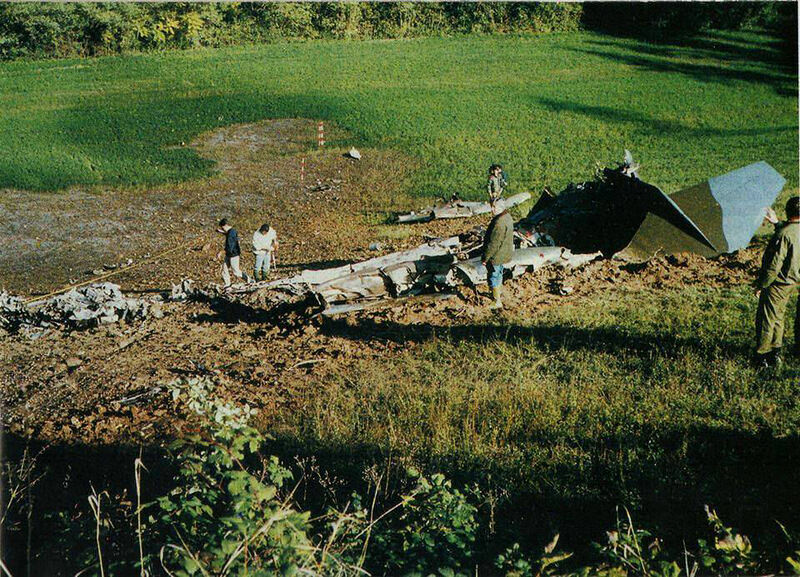 The planes crashed into the hills near Imola (Between Casalfiumaneseand Borgo, Tosignano not far from Imola). It happened around 18:15 local time after they took off from Rimini at around 18:00h. Some houses sustained damages, mainly to their roofs but gladly no further casualties were reported. Beneath some photos from the JP4 magazine in 1991.